Naureen Arbab clothing collection 2013 1Naureen Arbab is the talented and well known fashion designer in Pakistani fashion designer. She started her fashion designing career in 2008. Her fashion label offers casual wear, formal wear, semi-formal wear, party wear. 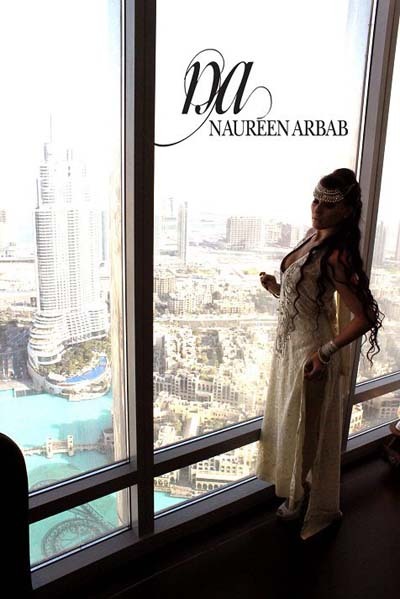 Every year, Naureen Arbab showcased her winter and summer collections for women. Recently, Naureen Arbab has launched her latest and exclusive formal wear collection 2013 for women. This formal wear collection 2013 is very elegant and stunning. Her formal wear collection 2013 includes stylish long shirts with the combination of tights, trousers and churidar pajamas. In this formal wear collection 2013, Naureen Arbab used bright and decent colors like golden, orange, brown. Some formal dresses are available in beautiful multi color combination like black and white, orange and yellow. Let’s give a look at the latest and exclusive formal wear collection 2013 by Naureen Arbab.